And maybe you could even make a million bucks at the same time. Globally, one of the most popular alcoholic beverages is wine. In the U.S. alone, it’s a $66 billion market. But it’s estimated that 43% of U.S. wine drinkers (that’s 36 million people) suffer side effects like headaches, congestion, and upset stomach — in short, they get a hangover. Instead, they’re caused by the histamines and sulfites found in all red, white, rosé, and sparkling wines. But what if those components could be removed? That’s exactly what a new startup called PureWine is doing. While leaving untouched all the tastes and characteristics that make wine such a pleasure to drink. 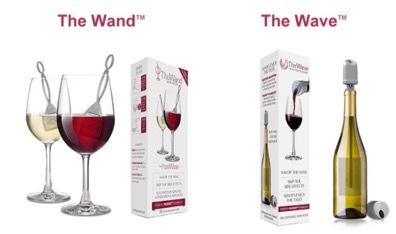 And the Wave, which filters an entire bottle of wine and costs $9.99 at retail. It currently sells its products in major retailers including Total Wine, Bed Bath & Beyond, and World Market. 2017 sales reached nearly $1 million, up 200% from 2016. And the company holds five U.S. & international patents, including one on its “NanoPore” filtration technology. PureWine has created a plan aimed at significant growth. It’s a disposable filter that fits into a permanent aerator. The aerator sells for $40, while each cartridge sells for $4. This is the classic “razor/razor blades” business model that encourages repeat sales. In addition, PureWine plans to develop new filtration products tailored for beer and spirits. Finally, the company plans to license its technologies to wine producers, so they can filter out hangover-causing ingredients prior to bottling. But to do so, it needs some growth capital today. Specifically, it’s raising $1.5 million from investors like you, with a minimum investment of $1,000. Should you consider an investment? And given the size of the opportunity, PureWine could realistically became an acquisition target by a wine and spirits company like Diageo (OTCMKTS: DGEAF), a food and beverage company, or a health and wellness company. On the “con” side, this is the type of startup that will eventually need millions of dollars in funding, and that makes it a riskier investment. It’s a consumer goods company with a physical product — the type of product that needs to be built in factories, warehoused, and shipped. Furthermore, the minimum investment is $1,000, which is relatively high. But if that doesn’t scare you off, why not dig into this opportunity further? Please note: Crowdability has no relationship with PureWine, or with any of the companies or platforms we write about. Crowdability is an independent provider of education, information and research on start-ups and alternative investments.